“I am in the world to change the world” wrote early 20th-century poet Muriel Rukeyser. Indeed, it takes each of us as private citizens acting collaboratively in the public sphere to effect the change we wish to see around us, whether a new development on our neighborhood block, investments in our local schools, or budgetary decision-making inside City Hall. In the brownfield-affected communities we support through Groundwork USA’s EPA-funded Brownfields and Equitable Development Technical Assistance program, that change is driven by an increasingly diversified set of stakeholders and calls for the use of innovative tools and approaches. 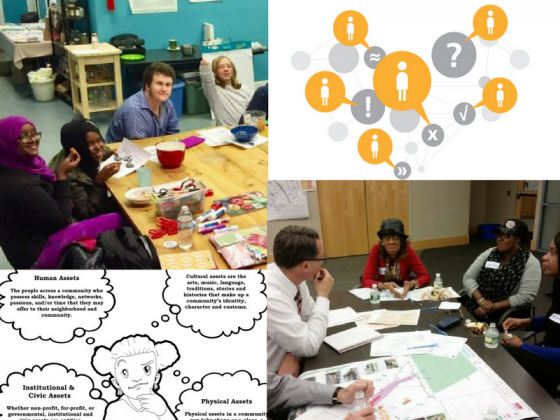 In Portland, Maine, our team fostered a new partnership between our client, an EPA Brownfields Area-Wide Planning grantee, and a nonprofit that engaged local teens to lead a community engagement process focused on neighborhood brownfield reuse priorities. Following design and implementation of the outreach process, the teens presented their findings to key decision makers, thereby shaping the resulting area-wide plan’s focus. In Fresno, California, we trained city planning department staff members and volunteers in ways to minimize exposure to lead and other contaminants of concern when gardening and greening vacant urban land. We also helped them design a “PhotoVoice” project, through which local youth and their families imagined new uses for vacant and contaminated parcels along “high potential” commercial corridors. In Toledo, Ohio, our team coached staff and volunteers of a new nonprofit through their launch of a youth development initiative to reclaim vacant lots for food cultivation, on-the-job training, environmental education, and community building. Through our work with many different brownfield-affected communities, we’ve developed and field tested a suite of equitable development tools and resources that help citizens and practitioners, both nonprofit and municipal, ensure that their planning and redevelopment efforts are inclusive of all kinds of people and promote personal, familial, and community-wide resilience. These tools comprise six domains that support revitalization efforts in brownfield-affected communities. Our Asset Mapping tools, for example, are designed to help local residents tap into the wealth of people, places, and things already present in their community to drive revitalization efforts. By helping communities identify and leverage the assets around them, these tools let people start where they are to create lasting change that can unlock economic opportunity accessible to everyone in the community. Our Inclusive Community Engagement tools are used to seed sometimes uncomfortable conversations with white practitioners, planners, and decision-makers about the value of engaging communities of color and low-income populations, stakeholders most frequently marginalized from planning and decision-making processes. Informed by longtime community organizers with decades of experience on the ground, these tools help practitioners address how to broaden the palette of ethnicities, genders, religions, ages, voices, world views, and lived experiences that inform their work at the local government level as well as why doing so is so important to achieving prosperity that everyone can enjoy. Implement an area-wide planning approach to redeveloping brownfield-affected communities. We regularly employ these Equitable Development tools in our work with communities across the US. By making them publicly available on our website, we seek to nurture a community of like-minded practitioners committed to planning, redevelopment, and decision-making practices that are inclusive, thereby driving more equitable development and environmental justice outcomes over time.